It's been over a year since I wrote anything here. I guess I felt that I'd nothing much to say. 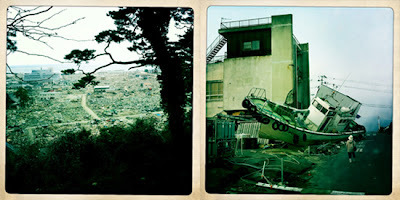 But the March 11 megaquake and tsunami in eastern Japan was, to say the least, a life changing experience. Not that my day to day life has changed all that much, and I was never really in any harm, but the way I view life has changed. When I had the choice to leave Tokyo I realized that my home now is here, so there never really was any question of leaving. Instead, I decided to lend a hand and joined the many people volunteering in the tsunami zone. Below is an article/journal I wrote for The Japan Times newspaper about my week as a volunteer. When the magnitude 9 megaquake hit northeastern Japan in the early afternoon of Friday, March 11, I was at work in The Japan Times office some 250 km to the south in Tokyo. As the building here shook, I ran down the emergency stairs fearing for my life and then stood outside watching the high-rises around us swaying. I was absolutely terrified — and it didn't get any better when the tsunami warning screeched out of speakers in the neighborhood. After running back inside — because the JT office is at sea level on Tokyo Bay — I found the newsroom was in chaos, with quake alarms sounding constantly on people's cellphones and the radio as the first aftershocks started to rattle the country, and TVs all showing horrific live images of the tsunami as our reporters scrambled to make sense of what was happening and get the story out. I admit I was so scared that I left work early to head home on foot, as all public transport seemed to be halted. In the days that followed, as the full impact of what had happened in the Tohoku region began to be revealed, I felt a little ashamed of my behavior. I had never actually been in any danger in Tokyo, and as I saw and heard what the people up in the tsunami zone were going through I wanted to help in any way I could. Then, after a colleague wrote a story about the nonprofit Peace Boat organization's disaster-relief work in the devastated coastal city of Ishinomaki in Miyagi Prefecture, I decided that I would take a week off work and volunteer. After attending a couple of orientation meetings, I was told I could join a Peace Boat group leaving for Tohoku on Friday, April 22. So, six weeks to the day after the quake hit, I boarded a Peace Boat bus in Tokyo, loaded with everything I would need to survive a week in the disaster zone — camping equipment, seven days' food and water, a dust mask, heavy-duty rubber gloves and boots, a helmet and goggles. We arrived on a rainy Saturday morning and set up camp in the grounds of Ishinomaki Senshu University university — but the real work didn't start until Sunday. What follows is an only slightly edited copy of the diary I kept at the time, fastidiously keying each day's experiences into my iPhone before curling up exhausted in my sleeping bag. The first full day of work in Ishinomaki. Our team has been assigned to clean out an izakaya (pub-restaurant) in the bar district of town. The mama-san who runs (or ran) the place is a great old lady, though her establishment, like everywhere else nearby, was trashed by the tsunami and is covered in toxic sludge — which it is our job to remove. Three watermarks line the walls, one for each wave of the tsunami, with the highest about 2.5 meters above floor level. The bar's huge fridges had floated up out of the kitchen and landed wedged in doorways, so to start with we had to move them. After that, we spent most of our time shoveling heavy black sludge. It was a hard but incredibly fulfilling day's work — though I've never been so dirty in my life! Should sleep well. Once again we woke up to sunshine. After breakfast and Radio Taiso, a warm-up calisthenics session (recorded from NHK Radio's morning broadcasts), we headed back to Ai-Plaza, the building in Ishinomaki that was the base for volunteer operations, to pick up some gear before heading back to "our izakaya." This week, Peace Boat has around 300 volunteers in Ishinomaki and at Ai-Plaza we get the chance to mingle a little with our colleagues while we wait to get started each day. Most volunteers are Japanese, and I'd guess that most are in their 20s, although some are much older. Non-Japanese volunteers are generally grouped together under the leadership of a bilingual Japanese leader, and our group — Team 41 — is one of three international teams here for the week. There are usually between five and eight people per team. Our leader, Ayumi Ando, 36, had been a volunteer on a previous trip to Ishinomaki, so we are lucky she can show us the ropes. Normally Ayumi works for a major American supermarket chain and her English is perfect. She has also been involved with Peace Boat since joining one of its cruises several years ago as an interpreter, so knows how things work within the organization. The rest of our team is made up of Robert Hamilton, 39, a Canadian associate professor at Meiji University in Tokyo; David Bray, 36, an English actor and full-time member of the acclaimed Blue Man Group theatrical ensemble based in Tokyo; Karen Sieg, 51, an American long-term resident of Tokyo who works for a Japanese bank; Piotr Ignatowicz, 29, a Polish-French employee at a Japanese NGO; David Brisson, 26, a French osteopath, currently studying Japanese in Tokyo; and myself, 43, an Aussie editor, originally from Sydney. None of us in the group knew each other prior to volunteering, but we clearly have a common purpose for being here and really clicked as a team from the beginning. It makes working together a lot of fun and a great pleasure. So, after picking up our gear, we spent the day rubbing down the walls and floor of the izakaya. The water from the tsunami left small deposits of dirt, seaweed or grass, which made a clearly defined line recording how high the waves reached. Compared to yesterday, today was much more detailed cleaning and, by the end of the day as we squeegeed the last of the water off the floor, we felt that we'd all been to izakayas dirtier than this. The people in the bar area of town where we are working are all in good spirits and obviously very appreciative of Peace Boat's cleanup effort. They seem particularly surprised and grateful that foreigners are here, as do our Japanese volunteer colleagues, who regularly thank us for being here. During lunch we met Ryuta Fukakusa, a young monk who explained how Jufukuji Temple, where we sat on our break, was one of the first places in the area to be cleaned and, with the exception of a slight stain where the waterline was, the buildings and the garden looked immaculate. He told us how it was his job to pray for the dead, and that they had buried 200 people in temporary graves in the cemetery on the hill behind the temple. At the end of the day, the owner of the bar next to our izakaya gave us a few bottles of wine he had dug out of the sludge. After a good wash they were still fine to drink. Today began with a sizable rumble and the sound of birds in the sakura (cherry-blossom trees). Then after a quick breakfast of coffee and my homemade banana bread, our team and the other Peace Boat volunteers met for the morning briefing and Radio Taiso warm-up. Our assignment for the day was once again in the bar area of town. So after grabbing the gear we needed — shovels, long-handled brushes and squeegees, white sandbags for sludge and brown ones for garbage, buckets, trowels, scrubbing brushes and a wheelbarrow or two — we hit the bar-lined streets of the Tachimachi nightlife district. Compared to the last job, Snack Ran, located down an alley of similar small bars, seemed to have got off lightly from the tsunami, and we were able to finish cleaning it in only two hours. With some time on our hands we decided to take a long lunch while we waited for our next assignment, and headed up the hill to Kashimamiko Shrine. On Saturday, our first day in Ishinomaki, all us fresh volunteers were taken up here during orientation to get an idea of the damage the tsunami had caused. That first time, no one spoke as we looked past the flowering cherry trees to the area below. The horrific images on the news and YouTube suddenly felt so real, so close. A few people prayed and I'm sure a few tears were washed away by the rain. On this, our second visit, the sun was shining, the cherry trees were in full bloom and the view was easier to take in. But it was still hard to absorb the sheer scale of what we were seeing, and impossible to forget. As I watched, I saw the tiny shape of an old woman shuffling through the rubble. The contrast between the cherry blossoms and all they signify — Japan, spring, the fleeting nature of life — and the dirty tragic mess beyond, will be etched in my memory forever. After lunch, and for the rest of the day, we bagged mud with an all-Japanese team in Jufukuji Temple, where we had met the priest the day before. It was hard, dirty work and before heading back to camp we all went to the washing area where we got hosed down with jet-sprays. Wet and tired, we were driven back to the university, dreaming of hot showers. The day ended as it started, with a small shake. We began with our normal routine — coffee under the cherry blossoms, Radio Taiso — then we headed into Ai-Plaza in Ishinomaki to pick up our gear. Our task for the day was to remove the mud and rubbish from the grounds of an optometrist's house. Komuro-sensei retired eight years ago, but the old two-story clinic he had been practicing in for 50 years still stood on his grounds, abandoned yet full of equipment — though the calendars read 2006. Behind the clinic was his garage and his beautiful traditional-style house, built 27 years ago. The watermark lined the walls about 1.5 meters up. In the garage sat his car, a classy Nissan President, which had floated up in the tsunami and landed parked diagonally in the center. It was covered in sludge, as was the entire garage floor. All the contents of the garage were stuck in the mud. First we bagged up the garbage and carried out anything that Komuro-sensei wanted to keep. I found an old microscope among his belongings and placed it in the "to keep" pile. Then we shoveled and bagged the mud into white dirt bags and carried them in wheelbarrows out into the street, where we piled them high. It's hard to describe the sludge and to do its foul stench any justice. But imagine the ancient black seabed of decomposing plant and animal remains set free from the ocean and then mixed with all that washed up in the waves of the tsunami — oil, dead fish, rotting food and vegetation, sewage — and then factor in six weeks of festering. Nasty stuff. The consistency of the sludge varies depending on the water content — from heavy, thick chocolate fudge to basically just black water — making bagging it up a challenge sometimes. The garage took us a few hours to get clean, and most bags were full of liquid. The mud has to be separated from the rest of the tsunami debris because it is toxic, so outside every place that has been cleaned are piles of white sandbags waiting to be taken away. I'm not sure what they plan to do with them. During our lunch break we sat near the local temple again. The people who walk past all greet us and thank us for being here. Today one lady on her way back from KFC spontaneously gave us one of her bags of fries. In the afternoon we finished clearing the mud from Komuro-sensei's place, went and got cleaned up and headed back to the university. Although we had been instructed to bring enough food for a week, occasionally groups of people show up in the evening to give food to volunteers. One night, some Pakistani students showed up with curry, and tonight a truck appeared with free chicken kebabs served by cute young, heavily madeup bargirls — who soon attracted a crowd of admirers. During the night it once again rained very heavily but I slept through most of it. Woke up to fairly heavy rain but managed to crawl out of the tent to see what the plan for the day was. Ayumi, our team leader, told us that work was canceled for the morning due to the bad weather and that we would reconvene at midday to see how things stood. Luckily it started to clear up, and we were able to get going to Ai-Plaza around 10:30. There, we teamed up with one of the other international volunteer groups and headed past Ishinomaki train station into a residential area. Piles of rubbish lined the streets waiting to be picked up by contracted workers and moved to the massive dumps that have been created on the city outskirts. At the dumps they separate all the tsunami debris: massive piles of tatami lie next to the wood of destroyed houses and general garbage made up of personal belongings and lost memories. But the most astounding thing is the sea of appliances — there must be hundreds of thousands of fridges alone — each one representing a home that was ruined. The area we worked today had a very different vibe to the bar area. People here seem more suspicious and less friendly, but that may be because this is where they live, not their place of business. After the tsunami, most people began to clear out their damp belongings and put them outside their homes. The problem with doing that, however, was that the city would not pick up trash on private land, so today it was our job to move the stacks of wet tatami mats and rubbish to the local designated trash area. Wet tatami mats are damned heavy, so we piled them in wheelbarrows to move them. It was heartbreaking to see the photos and other private items that lay among the trash, and I couldn't understand why people were not keeping them. That was until one woman told us she didn't want anything in her house that reminded her of the tsunami — and that meant anything, including photos, that was water-damaged. The rest of the day was spent fulfilling people's requests to shift their stuff to the garbage area — this included removing two huge wooden speakers, each one more than a meter high and weighing about 200 kg, from the hardly damaged house of a rich music lover: the least satisfying job of the week. For dinner, we treated ourselves to a meal at one of the few restaurants that have recently reopened in Ishinomaki — and enjoyed our first beers of the week. It tasted good to be helping the local economy. Our last day of work began with a beautiful sunny morning. After breakfast, roll call, and Radio Taiso — a new version this time — we got a lift into town for the final time, We passed the Ground Self-Defense Force camp with its rows and rows of army-green tents and piles of equipment and joined a steady flow of trucks and troops heading to town. Each day, military helicopters flew above us as we worked, a constant reminder that there were parts of Ishinomaki where SDF personnel were still searching for bodies and doing the heavy lifting required in the hardest-hit area by the coast. The role we, as volunteers, play here is to clear the parts of town that are still standing in mud and rubbish so people can get back to work and return their lives to some semblance of normality. But the area near the coast has been erased and will need to start from scratch. After picking up our gear from Ai-Plaza, we returned to the izakaya we had cleaned up on Sunday and Monday. We found that a huge fridge, which had been balanced precariously in the kitchen and was too big for us to handle, had been removed, so we were able to get in and take out the last of the sludge. It took us a few hours to finish up, and there was a huge sense of achievement when we squeegeed out the last of the water and cleaned and rehung the front doors back in place. Hayashi-san, the owner, had a huge smile on her face when she saw what we had done, and we all promised to return to Ishinomaki for the reopening of the izakaya. With our last (and first) job out of the way, Team 41 went for a beer around the corner at a small bar that had opened early for business. The proprietress was a classic old bar hostess with the mannerisms of a young girl and a voice as rough as cheap whisky. While she flirted with us and her old friend told us she was looking for a new husband to replace the one lost soon after the tsunami, a small aftershock punctuated the conversation. That night was gloriously starry, and our Peace Boat team had our last meal together in the communal tent, chatting late into the night. Saturday, April 30 Woke up just before 5 a.m. and stuck my head out of the tent. It was a cold morning and a heavy dew covered our tents, but the sun was rising and light shone through the cherry blossoms. Everyone was up early to pack, but I think we all wished we weren't leaving. We had been able to help Hayashi-san, Komuro-sensei and a handful of others, but there are hundreds of thousands of others like them who need help. As a team, we worked really well together and will try to all come back again. Until then, I'm sure that Ishinomaki will never be far from our thoughts. You can read the original version and see a slideshow of images at The Japan Times online.